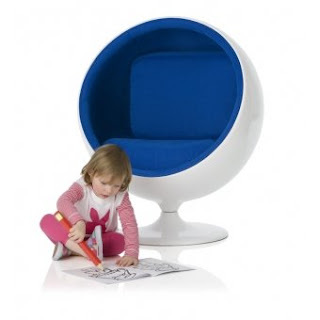 This week's big love is the Play Ball, a fantastic replica of the classic 1963 Ball Chair by Eero Aarnio. Made from a molded fiberglass shell with a fully cushioned interior it is the perfect place to snuggle down in. I found this on an Australian site and I would love to find stockists around the world - especially in the UK. So if you know of any please do drop me a line. The Play Ball is available in blue or red and I can just picture a row of three in my garden room!